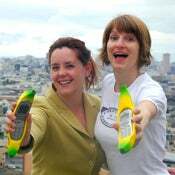 Going bananas trying to hide your cellphone from muggers? Surely, there is much to be said about a fake banana holder for your cellphone. I would venture the guess that it's there to prevent muggers from seeing your slick mobile phone and giving you the old heave-ho. There are a couple of problems with this: 1) As the Shiny Shiny blogger mentions, talking into your banana will probably get you carted away—though muggers probably won't be the ones doing it. 2) I'm fairly certain anybody who's ever seen a real banana is going to be pretty suspicious of this. It seem so to verge on the neon . Granted, at ten dollars, perhaps it's cheaper to hollow our an actual banana and use it as a disguise. Mushier, to be certain.